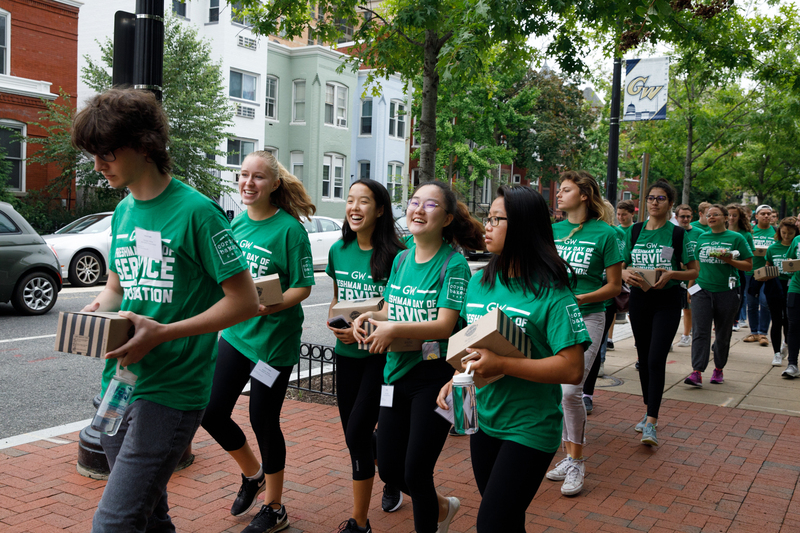 The university’s largest Freshman Convocation and Day of Service featured service at more than 40 sites in the D.C. area and encouraging words from GW administrators. In the two weeks since she arrived on the George Washington University campus, first-year student Sarah Cohen has taken “full advantage” of being in Washington, D.C., and already has accumulated an impressive list of monuments and museums visited. On Saturday, Ms. Cohen tried her hand at a new skill—wall painting. 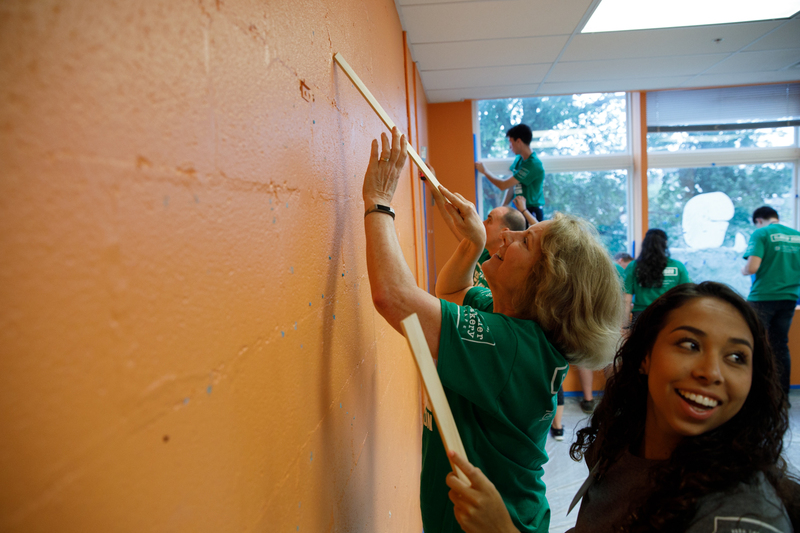 Ms. Cohen and nearly 40 other first-year GW students painted the walls of a daycare classroom at the Gap Community Child Center in Northwest D.C., which has educated the children of immigrant and low-income families since 1982. 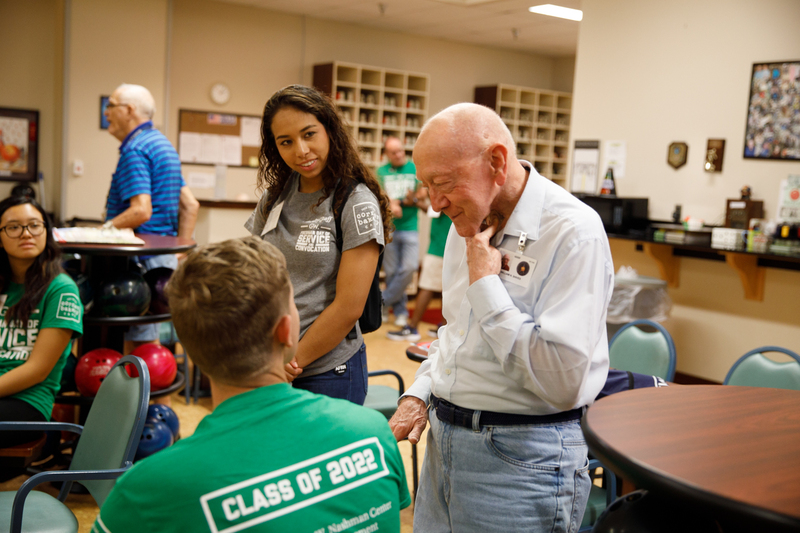 Their efforts were part of the university’s 10th annual Convocation and Freshman Day of Service. 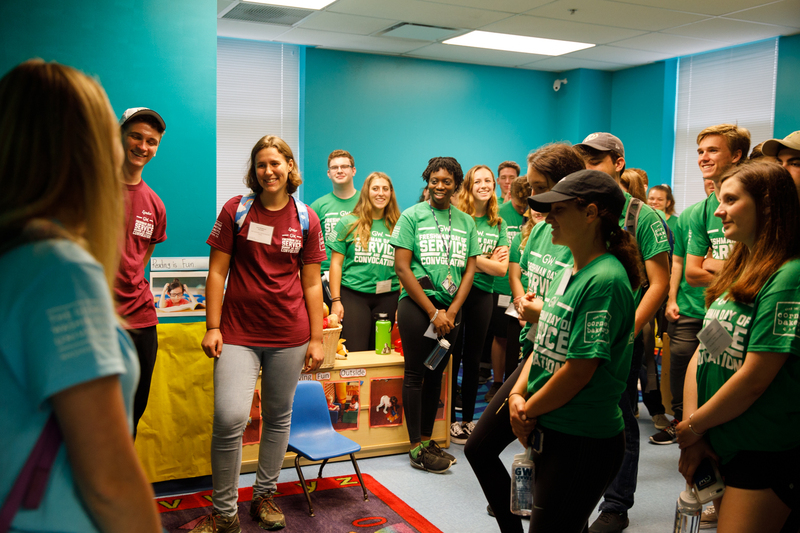 The student volunteers at the child center were among 2,441 students, faculty and staff spread across 46 service sites in Maryland, Virginia and Washington, D.C., accumulating nearly 10,000 community service hours as part of the annual tradition. 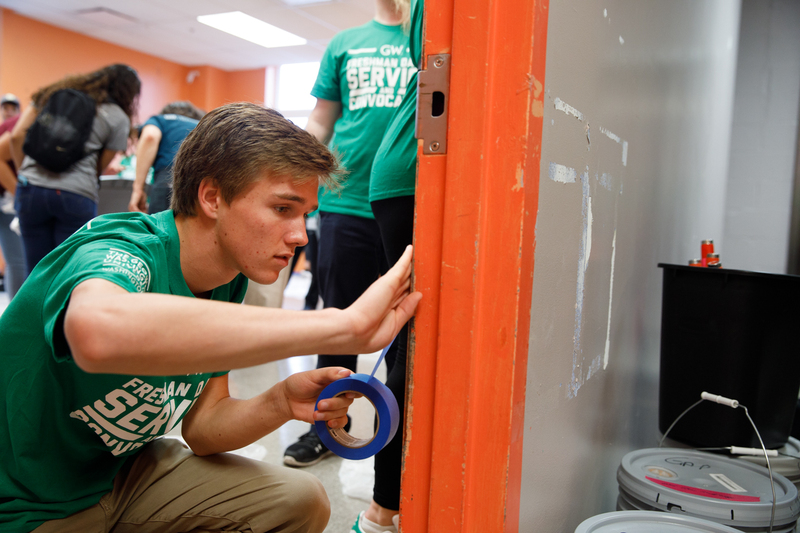 The number of participants was 237 more than last year, making it the university’s largest day of service to date. 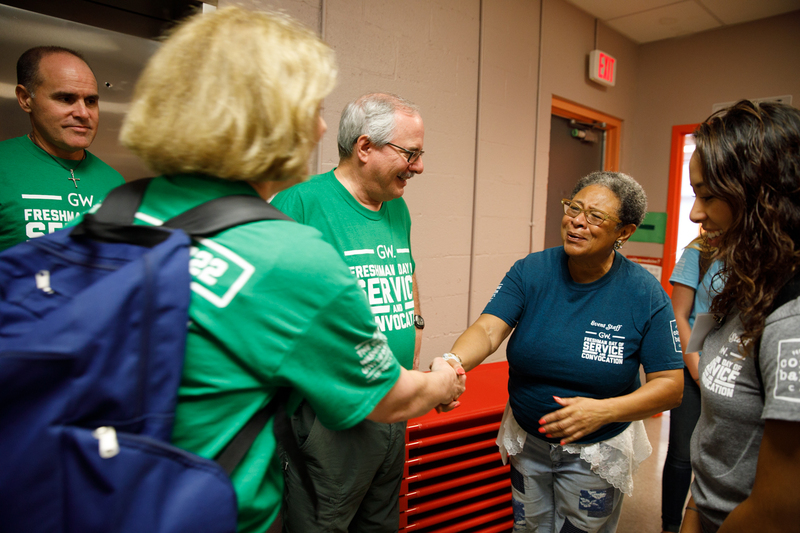 Organized by the GW Honey W. Nashman Center for Civic Engagement and Public Service, the 10-year tradition has run since former First Lady Michelle Obama challenged GW to complete 100,000 volunteer hours in one academic year. In every year since, the university has exceeded that number, completing over 700,000 service hours in each of the past two years. 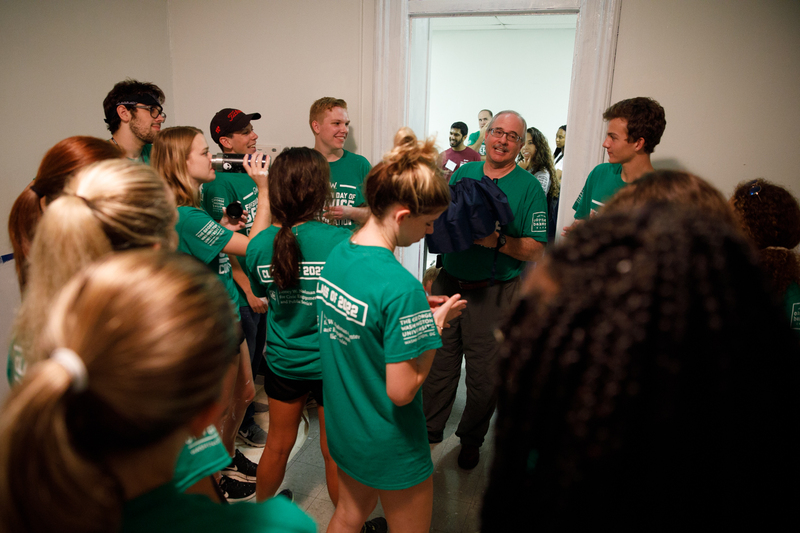 Amy Cohen, executive director of the Nashman Center, said that on this year’s Day of Service, the GW community completed 9,708 hours of service. 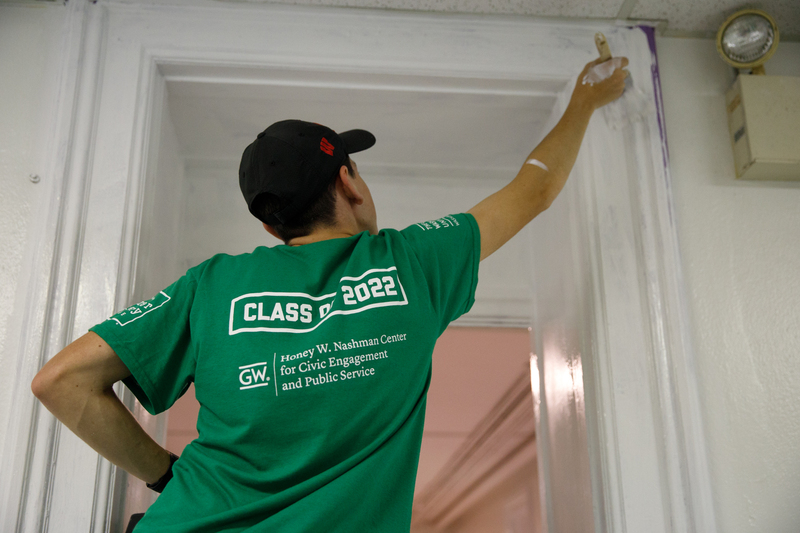 First-year GW students spread out across the area painting classrooms and historic buildings, visiting senior veterans, creating teaching materials for museums and early childhood classrooms, and landscaping when the weather permitted. 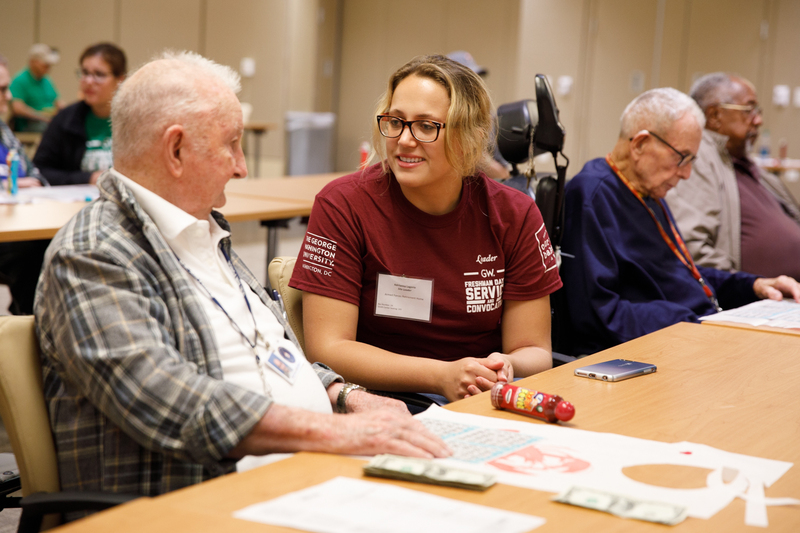 “Students had a chance to meet and serve alongside our neighbors and explore the recreational, cultural and educational assets of the local community,” Ms. Cohen said. 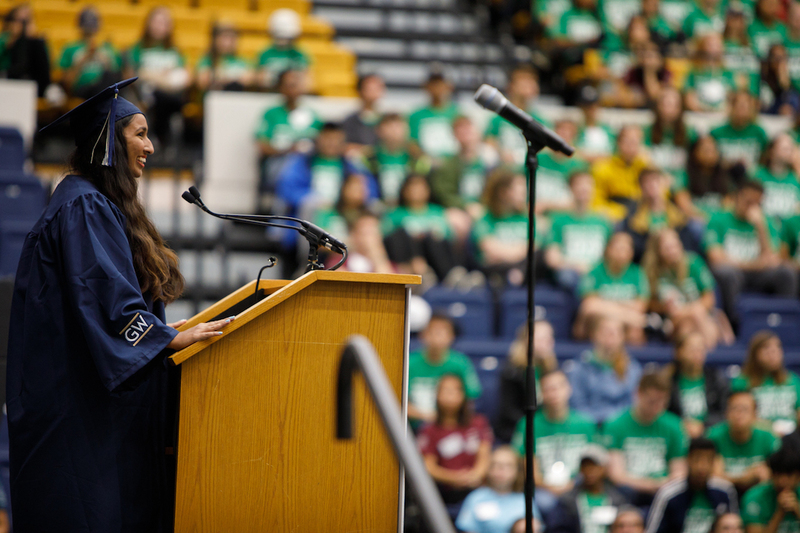 Before heading out from campus and working on service projects on campus and around the region, the class of 2022 heard words of welcome and encouragement from GW President Thomas LeBlanc, Provost Forrest Maltzman and Crystel Sylvester, who was the student speaker for this year’s event. Ms. Sylvester, a senior in the School of Business, talked about her journey as a GW student, starting with her arrival in D.C. from a suburban town in South Carolina to her growth as a person that she credited largely to her service-learning opportunities. “When I got here, I was overwhelmed by opportunities,” she said. “I felt pulled in many directions. I wanted to land a top internship, but I still wasn’t sure if I wanted to go into tech or fashion or hospitality. Crystel Sylvester, a senior in the School of Business, welcomed the incoming class with words of encouragement at Convocation. Dr. LeBlanc encouraged students to use their skills to give back to the community. In the Marvin Center, Majula Swareh, a junior anthropology major, helped first-year students create materials that will help teach skills used in early reading lessons for GW’s partner pre-schools that serve students from lower-income Washington, D.C. families. 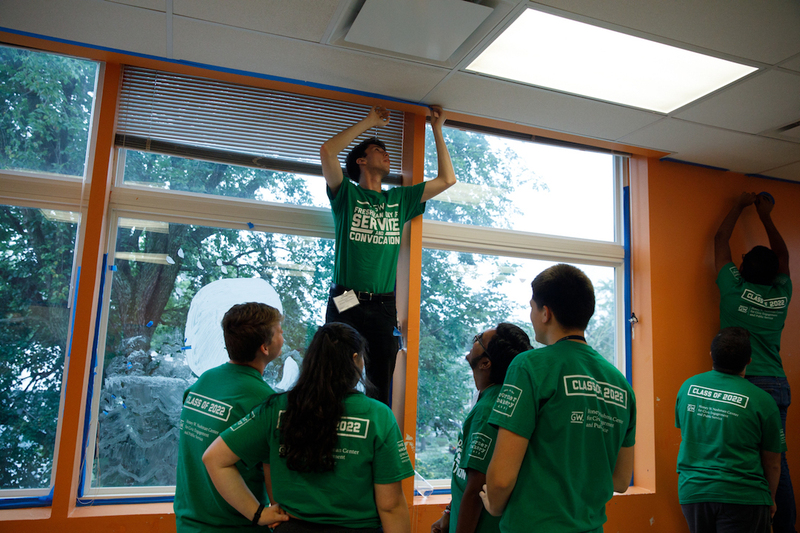 GW is a host for this national AmeriCorps program, Jumpstart. There was brightly-colored construction paper, hole punchers and markers everywhere as the first-year GW students chatted with their peers at the tables around the room while they worked on different craft projects. She added that this kind of service work—creating materials for communities that need them without necessarily interacting with the communities yet—is a great induction for first-year students into further community service work that is more hands-on. “This could be the first step to going into the communities and working with them,” Ms. Swareh said. 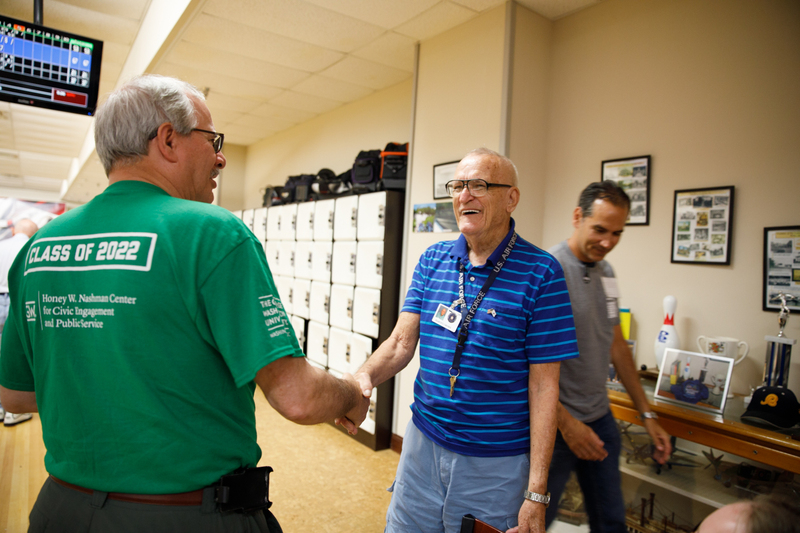 Dr. LeBlanc and his wife, Anne, joined student volunteers at several sites throughout the day including the Armed Forces Retirement Home and the Gap Center. D.C. Ward 7 Council member Vincent Gray, B.S. ’64, also surprised students beautifying the parking lot of the Fort Dupont Ice Arena in Southeast Washington. At the Gap Center, Executive Director Zinora M. Mitchell-Rankin, J.D. ’79, welcomed the volunteers, describing their work as “magnificent” and especially helpful because of the high costs of maintenance. “Most of our parents are receiving a subsidy and having the money to do this kind of fixing up is not always easy, and yet it’s exceedingly important to present a center that reflects the value that we hold for our children and our families,” said Ms. Mitchell-Rankin. 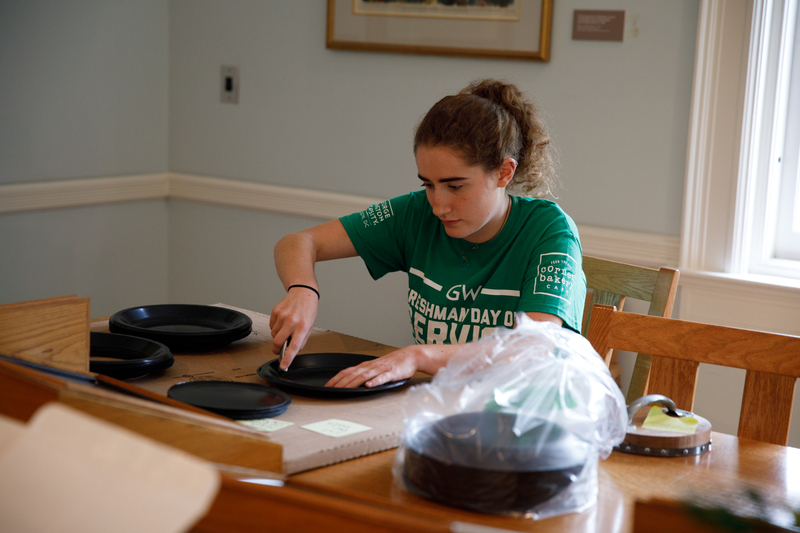 Freshman Day of Service is also part of GW’s commemoration of 9/11 and the Tomorrow Together campaign. 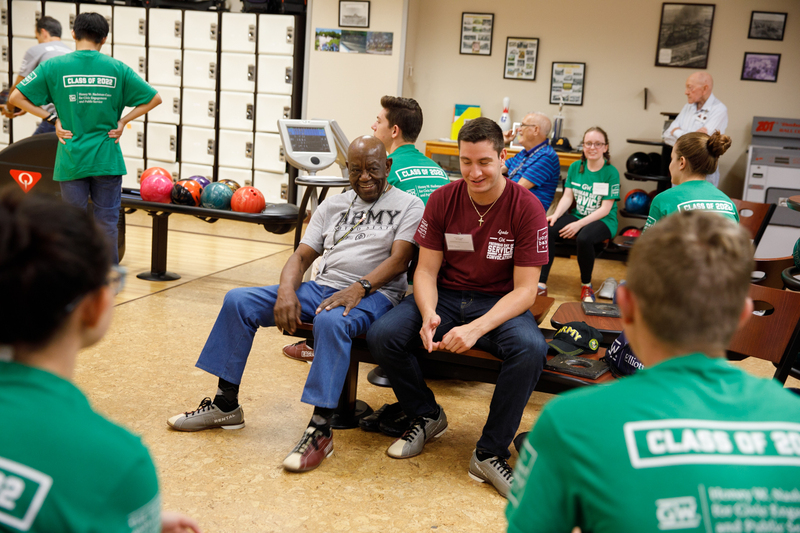 James Gordon, a first-year student who volunteered at the Armed Forces Retirement Home, found himself bowling with veterans as a part of his service project. So, you have been on our campus for a couple of weeks now—I've seen you. But today is the first day in which you formally become part of our campus community. Dr. LeBlanc discussed the dangers of social media and encouraged delaying off-campus internships in the first academic year during the Convocation ceremony.